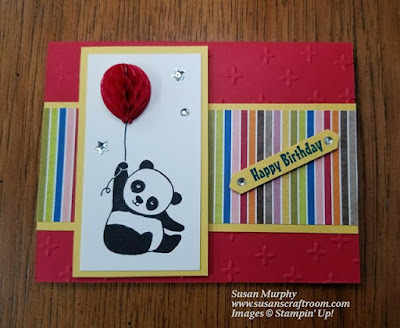 Susan's Craft Room: Happy National Panda Day! Today is National Panda Day! Stampin' Up! has the stinkin' cute Party Pandas stamp set that is being offered for a free selection during the annual Sale-A-Bration promotion. You still have a couple of weeks to get the FREE Party Pandas stamp set during the Sale-A-Bration promotion! This card is still one of my favorites that features one of the cute pandas.